Can you tell I struggled with naming this shirt? What in the world do I call it? Ruffled Rectangle works for now, right? But I love the ruffled piece of fabric beneath those little flower buds. And I think my little lady did too. 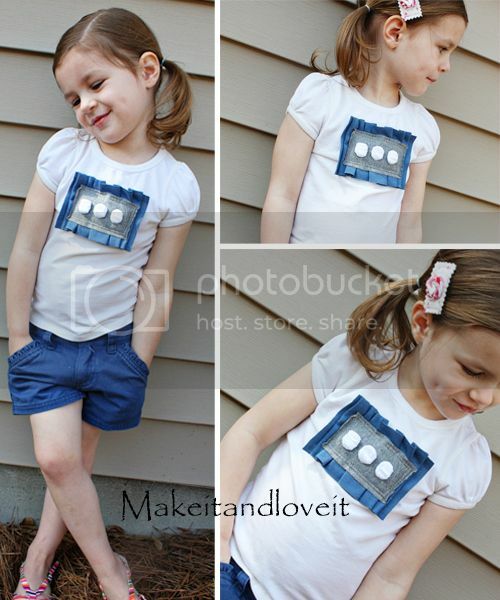 Kind of a fun and fresh way to spruce up a plain Tee. Want to try your own? I used scrap knit for all of the pieces. The biggest piece is about 3.5 x 12 inches. The grey rectangle is 2.25 x 4 inches. And the white strips are 4.5 inches long and about 1 inch wide at one end and about 1/2 inch at the other. See how they are more narrow on one end? So then I folded up each strip like an accordion……. …….and centered the folds to get smaller and smaller as I folded the most narrow end on top. Then I sewed them onto the grey piece with one stitch down each middle. Now gather your big piece and lay it on your shirt just how you’d like it. I didn’t gather the material with thread, only situated it with my fingers. Then lay your other piece on top and pin in place. Sew around the outer edge two times, to secure it in place. 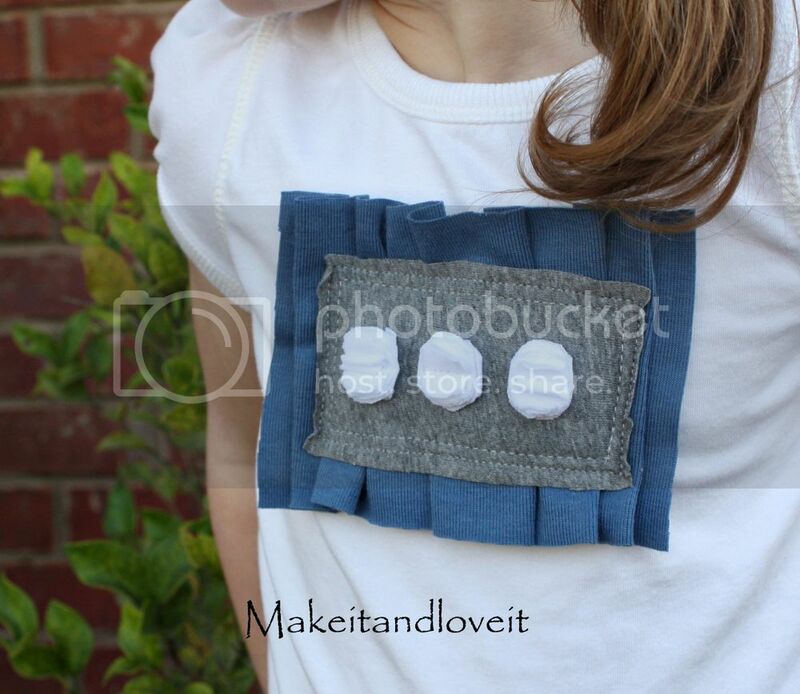 Make sure you have include all of the folds of your ruffle in your stitch and everything is securely in place. And then put on your little girl and let her feel fancy free. And why not try this same technique for yourself? « New sponsor and giveaway!! This one s creative. I like it. hi! You are very talented and creative!!! I love visiting your blog! What a unique and adorable shirt!! Too cute! Your lil girl is AAAdorable too! for sure! too cute! 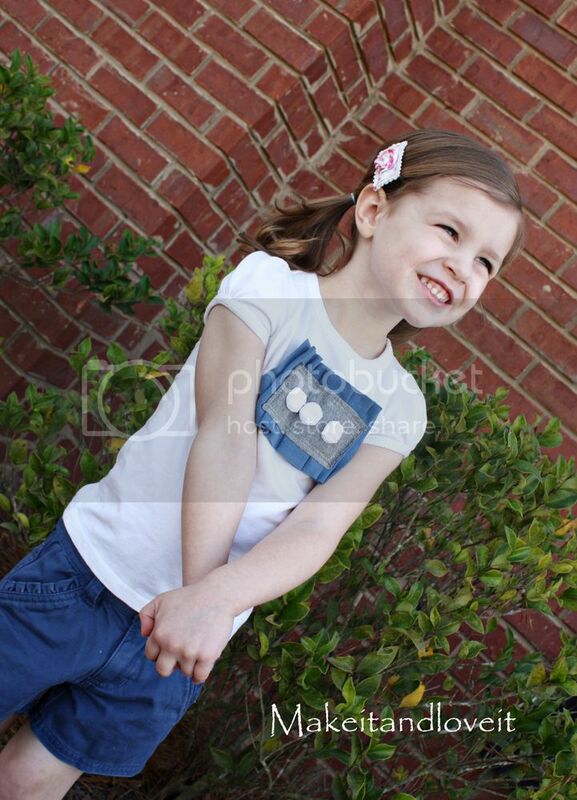 your little model is soo precious! If you had a tan ruggle and a dark brown rectangle and the white fluffies…it would look like a s'more. Super cute. Wanna try making it. I'm curious how this shirt looks after a couple washes?? That is really cute and creative, I love it! Thanks so much, I'll be linking. 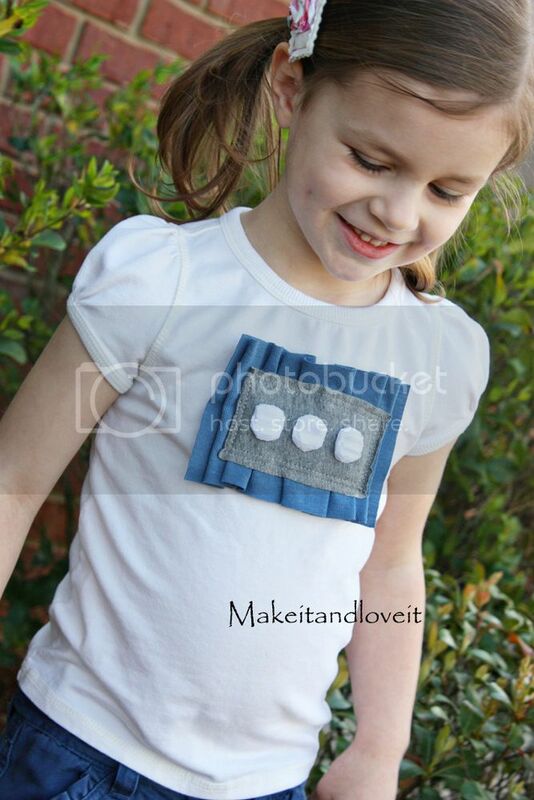 I love the shirt idea, but I want to know how you made her hair accessory? Feel like sharing?